CSLS has helped thousands of construction professionals to become licensed C33 contractors in California, with more than 99% of our students passing their exam on the first try. We put every available tool and resource on your side, so you can feel confident about your test and jump into your new career ready to go from the first day! If you want the very best of what CSLS has to offer, this program is the one for you. After you’ve been through this course, you'll either pass the exam or we’ll pay for you to retake it. In fact, we're so confident you'll pass the first time that we even pay for your bond fee the first year. their Contractors License with 99% first time passing success rate. Let us help you get yours. Do you already have your test date, or are you in a hurry? Then the crash course is designed for you. This short study course has been designed with speed and efficiency in mind. This course is available for all 43 trades and created in a step-by-step, easy-to-follow format. Do you live far away from a school or just prefer to get a live class experience from the comfort of your own computer? Then our live online program is perfect for you, taught by top industry instructors in the same format as our in-class courses. Do you want the study materials for the California Contractors Licensing Exam so you can study at home, following your own pace? If so, the home-study kit is right for you. It's available for all 43 trades and created in a step-by-step, easy-to-follow format. Advertise Your California Contractor Business. Advertise online, on your truck, in newspapers, and anywhere else you can think of. You have to be a licensed contractor to legally compete for the best, highest-paying construction projects. Bid on Larger Projects and Earn More Money as a Licensed Contractor. Being a licensed California contractor means you can legally bid on projects over $500. Why not earn more money, and have more control over your career, as a business owner? Expand Your Business and Network With Other Licensed Contractors. Licensed contractors want to work with other professionals who have the proper qualifications as well. That way, they can stay on the right side of the law and know they are getting the best workmanship for their clients. Taking classes with other licensed contractors can open the door for referrals and other business opportunities that may not have existed. Protect Your Business, and Your Future, by Becoming a California Licensed Contractor. The California State License Board catches hundreds of unlicensed contractors working within the state every month – taking away their income, future, and financial stability instantly. As a licensed contractor, you don’t have to worry about these kinds of troubles. Obtain Permits from the City for Your Clients. Only California State licensed contractors can apply for building and construction permits on behalf of their clients. Completing your exam is the first step toward keeping your customers out of trouble... not to mention avoiding red tape, construction delays, late payments and lost projects. Charge More for Your Work and Time as a California Licensed Contractor. It’s no secret that licensed California contractors, like most legal business owners, earn higher wages and project fees than unlicensed construction workers do. Information About The California Licensing Exam For C33 Trade. *Laws are subject to change by the CSLB, and credit for a college degree or self employment is determined at their sole discretion. Please call one of our counselors to make sure these laws are up to date: (800) 409-8237 FREE. The Law and Business portion (general knowledge) is a 3.5-hour, multiple-choice exam you take on a computer. It covers business management and construction law. The exam is given by the CSLB at various locations throughout California. The Trade Portion is also a 3.5-hour, multiple-choice exam, but covers specific questions related to your trade. What To Bring To The Exam? Your appointment letter, valid ID and nothing else (everything you need to finish your test will be provided by the testing center). Before you are admitted, state employees will check your appointment letter to make sure it matches your ID. Once you have been allowed to enter, you will be shown to a cubicle with a computer. You will have a small dry erase board, marker and sponge to use instead of scratch paper. Your exam begins with an electronic thumbprint for identification purposes, followed by a video on your testing computer before you see any of the exam questions. No personal calculators, cell phones, pagers or other electronic devices are permitted in the testing area. Before you can be scheduled for your exam, you must go through an extensive admissions process with the CSLB. During this time, you will be required to fill out an application, provide proof of identity, select a business entity format, pay your license fees, and complete other paperwork. Who Needs a California Contractor’s License & What Kinds Are There? In California, anyone who contracts to perform work on a project that is valued at $500 or more for labor and materials must hold a current, valid license from the CSLB. The CSLB licenses contractors in 43 different classifications. This ranges from general contractors to swimming pool contractors, landscapers, painters, electricians, plumbers and many more. General building contractors usually oversee projects and coordinate the specific licensed subcontractors for a job. Specialty or subcontractors are usually hired to perform a single job. For example, if you want only roofing or plumbing work, you may want to hire a contractor licensed in that particular specialty. A general building contractor may also contract for specialty work, but must hold a specialty license for that work or actually have a specialty contractor do the work. The only exception is if the job requires more than two types of work on a building. Then it is appropriate for a licensed general building contractor to contract for and oversee the entire project. For example, if a kitchen remodeling will involve plumbing, electrical and carpentry work under one contract, one should hire a licensed general building contractor. Under these circumstances, a general building contractor may perform all of the work on a building or subcontract parts of the job to contractors with specialty licenses. The first step in becoming licensed as a California state contractor is making sure that you are eligible to take the test and become certified. In California, there is a set of guidelines that have to be met before you can apply. First, you have to be at least 18 years of age and have had four years of construction experience within the last 10 years (or two years of work experience plus a four-year college degree). There are also certain guidelines about the amount of working capital you have to have on hand, as well as your ability to be bonded. For most of the people we work with, however, passing the California State Contractor’s License Exam is the biggest hurdle, and the one that prevents some construction professionals from taking the next step in their career. With our 100% guarantee and 99% success rate, there is no need to fear taking the next step into the rest of your life. Your future of becoming a licensed contractor is now within reach. 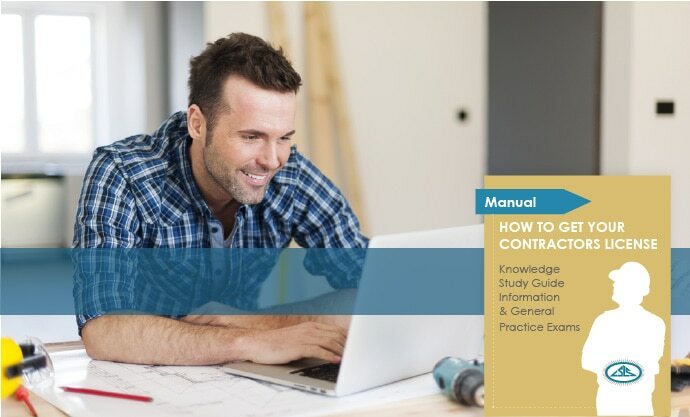 The California licensed contractor exam actually consists of two parts: the business and law section, which contains 115 questions, and the specific trade section, which can have 100 – 120 questions. The test itself is multiple choice (no writing or essay answers needed) and is taken in person. Note that your California State Licensed Contractor Exam will be timed by a test monitor, but very few of our students struggle to finish within the 2.5 hours that are given. Although it typically takes at least a month to receive a test date for the California State License Exam, some students are able to take the test in as little as two weeks. Once you have been assigned a date and have completed the exam, you will be given a pass/fail result right away in person, on the same date of the exam, along with some areas for improvement if you have not been successful.